A kunai is a traditional Japanese multifunctional tool that is assumed to be made based on the masonry trowel. A kunai resembles a fish in the shape. There are two types of kunai traditionally used by Japanese warriors – a short kunai and a big kunai. 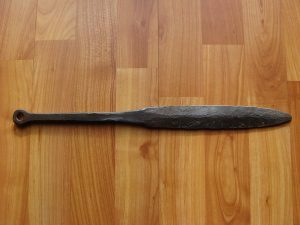 It is a good and plain tool made from the iron having no edged blade as it seems at the first sight. Actually, this can be a good military weapon in hands of a professional martial arts warrior as Ninja. Previously the kunai was used by ordinary workers as gardeners, bricklayers for laying, digging or breaking something. When fastened to the rope the kunai was used as the hook to help climbing the heights. Against the myths, the kunai was never used as the missile weapon though the warrior could throw it and hurt the enemy at ease. 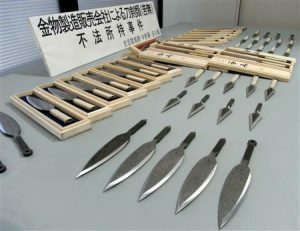 The kunai was largely used as the stabbing weapon in close combat with the ring at the haft used to hit on vulnerable and sensitive body parts. Like most varieties of the agricultural inventory, the kunai found its niche in the arsenal of weapons used by the shadow warriors.